If you really sit and think about some of the traditions we have then you will realize how random some of them seem. Christmas is one of those traditional things that most people do not question because we often times get free stuff. This short series of articles will explain a few of the major traditions revolving around Christmas and why they are the way they are. The word mistletoe essentially means “poop on a stick” by some translations, but more accurately, I believe it to mean “magic stick”. 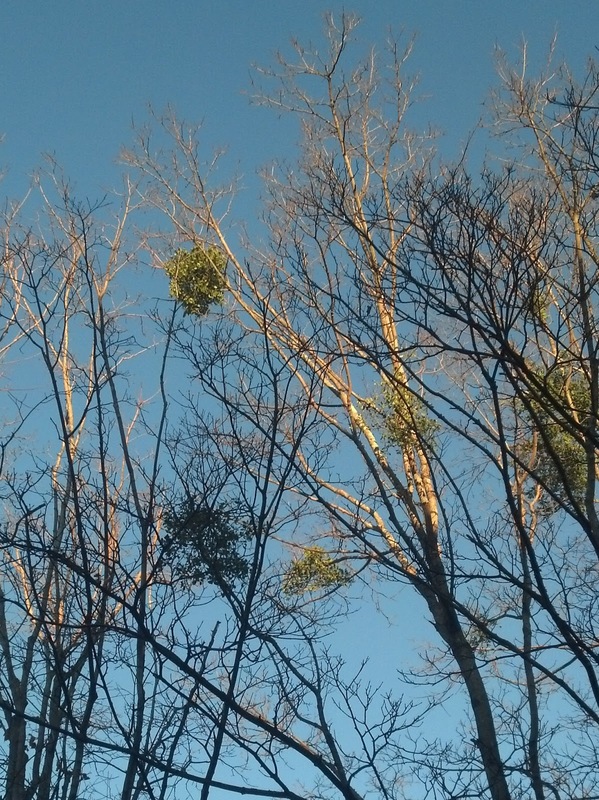 Mistletoe spreads like many other plants by sticking to birds, and it is pollinated by insects. None of this gives much insight to kissing underneath it during Christmas. We will need to go back in time to find out more. Mistletoe was viewed in ancient times as an aphrodisiac. This does not mean that going outside and chewing on the twig will solve your ED issues. Mistletoe in various regions is poisonous and can kill humans. In Europe some herbalist can brew a specific type into a tea and claim it has healing and arousal properties. Its ability to remain green as the host tree lost its leaves mystified ancients. There is another story that says a man was told to use mistletoe to travel to the afterlife to accomplish a task. The original story could have been to warn people that this plant will kill you thus sending you to the afterlife. Instead it was revered. It made its way into Saturnalia being a mystical plant with mystical properties. In Saturnalia fertility and abundance were important. People were most likely farmers; farmers want an abundant harvest. Farmers also prefer to have large families to help tend the farm thus making fertility important. In true Roman decadence they would celebrate fertility with much more than kissing underneath the magical mistletoe. Mistletoe is also most noticeable in the winter making it fit with its significance the date of Christmas. No one claims that December was the month Jesus was born. But the 25th is surprisingly close to the winter solstice which is the 21st. The date coincides with the Roman festival Saturnalia. It typically started on the 17th and lasted seven days. Much of how we celebrate Christmas comes from Saturnalia. Saturn was the god of agriculture. In ancient Rome agriculture gave an empire the ability to be wealthy. If they had a surplus of food it was not costly and people could pursue other skills that would be useful to a growing empire. A decadent display in typical Roman carnality was required to have a good harvest. Saturnalia was celebrated even after Rome removed it from their calendar. And many European pagan religions had some connection to the winter solstice. The celebrations ranged from gift giving to fertility celebrations under the mistletoe. Once Christianity came into power in Europe they needed a replacement for all of these splintered pagan celebrations. The Catholic church in order to satisfy people's need for a big year end celebration established Christmas. The church incorporated many of the traditions of pagan religions, and everyone was happy. In those days, religion was more of a control measure than a belief. Countries would change religions depending on who ruled them. Few people had a choice as to what god they believed in because “it was not worth losing your head over”. Catholics have an entire list of Christmas dates. They range from New Years to February 2nd. Christmas was intended to be a feast that lasted many days. The first set of days is The Christmas Octave. It is the octave because it lasts for 8 days ending on January 1 aka New Years. The next religious even after Christmas is Epiphany. Epiphany has changed its meaning over the years, but in general represents the major revelation moments in the life of Jesus. These events range from the three wisemen to the Nativity Feast(which originally was on Jan. 6th).